Well, Cloud Next 2019 is upon us, and if you happen to be one of the several thousand people descending upon Moscone Center this year and want to get your fill of Firebase knowledge, you’re in luck! There are a bunch of great sessions the Firebase team is putting on throughout the conference. And if you want to talk to any of us in person, swing on by the App Dev zone in the expo area. We’ll be at the Firebase booth from now until Thursday the 11th. But if you’re not able to make it to beautiful downtown San Francisco this year, never fear! You can still find out everything that’s new with Firebase in this blog post, so read on! For those of you who are Google Cloud Platform customers, we are pleased to announce that the GCP support plan now includes support for Firebase products. This means that if you are using any of the paid GCP support packages, you can get the same high-quality support that you’ve come to expect from GCP for Firebase products as well. This includes target response times as quick as 15 minutes, technical account management (for enterprise customers), phone support, and much more. Now if you’re not a paying GCP customer, don’t worry — free community support isn’t going anywhere. But for many of our larger customers who were interested in a more robust paid support experience, this new option is welcome news. To find out more, you can check out the support pages on the GCP site as well as the Firebase Support Guide. One of the new GCP products that we announced at this year’s Cloud Next is Cloud Run, a fully managed compute platform that lets you run stateless containers which you can invoke via HTTP requests. And we’re happy to announce that you can use Cloud Run in conjunction with Firebase Hosting. Why do you care? Because Firebase Hosting isn’t just good for hosting static sites. You can run microservices on top of Hosting as well. In the past, you did this by connecting your Hosting site with Cloud Functions for Firebase, which meant that you had to write all of your code in Node.js. But now that you can deploy stateless servers through Cloud Run and have Hosting talk to them, you can build your microservices in anything from Python to Ruby to Swift. In the past, you could filter your event reports in Google Analytics for Firebase by a single user property (or audience). So you could quickly answer questions like how many iOS 12 users were signing up for your newsletter. But up until now, you couldn’t filter by more than one different user property at once. So if you wanted to find out how many iOS 12 users on iPad Pros were signing up for your newsletter, that wasn’t really possible. 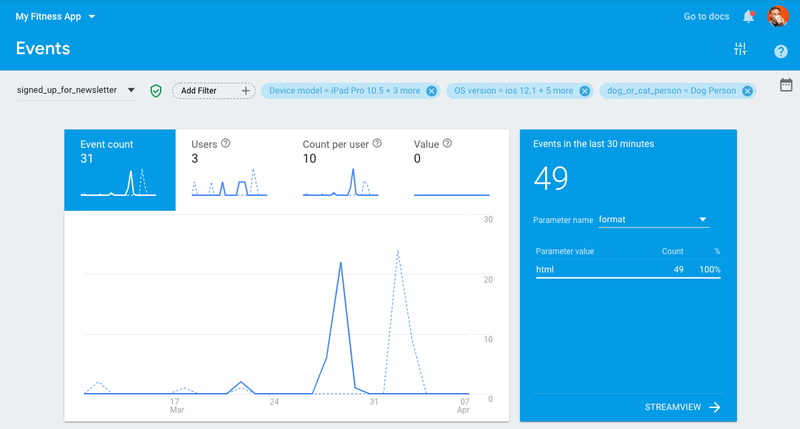 Well, we’re happy to announce that you’ll be able to filter your Analytics event reports by any number of different user properties or audiences — both ones defined by Firebase as well as custom user properties — at the same time. So if you want to find out how many iOS 12 users with iPad Pros who prefer dogs over cats signed up for your newsletter, that’s now something you can see directly within the Firebase console. The one caveat here is that your site needs to be hosted using Firebase Hosting. If migrating your primary domain over to Firebase Hosting isn’t feasible, you can easily setup a subdomain of your site instead. For instance, maybe you can’t move all of www.example.com to Firebase Hosting, but you could pretty easily set up links.example.com on Firebase Hosting, and use that for your Dynamic Links moving forward.